Ryan Holliday is the team manager at Kawasaki Team Green these days, running the most storied program in all of amateur motocross, and one that tied in tight with Loretta Lynn’s—Team Green set up shop behind the starting gate at Loretta’s for the very first event in 1982 and has been a huge part of the event ever since. The list of Team Green riders who went on to have stellar professional careers include Jeremy McGrath, Mike Kiedrowski, Donny Schmit, Kevin Windham, Robbie Reynard, Ricky Carmichael, James Stewart, Ryan Villopoto.... The program keeps going and going, recently producing professional stars like Austin Forkner, Adam Cianciarulo, Justin Hill, Garrett Marchbanks, and more. When I was a kid racing at Loretta Lynn's, I was always so much more interested in everything else but the racing. Even when I was really young, I just wanted to watch all these kids I read about in Cycle News from all over the country. I was usually star-struck by the kids in my classes, so I didn't stand a chance to be competitive. I thought they were so badass, I wanted to watch them instead of race them. I'd get lapped by someone like Justin Buckelew, who was a minibike god in the nineties, and I'd talk to myself about how fast they were going and how sick they looked or how good their bike sounded. My biggest flaw as a racer was that I never felt like I belonged with the best. #tbt to simple times on the starting gate @lorettalynnmx in 1986. No trainers, coaches, goggle guys, gear guys, boot guys, helmet guys, drink guys, motor guys, man friends, agents and so on....just @emig47 and his Dad. He also won that year. Looking back, I feel like the only reason I wanted to qualify for Loretta's each year was so I actually got to go and watch. I hated the track—it's so hot, I never once had fun in a moto there, and that's why my results were terrible. Once I made it, I didn't care. I just wanted to watch Charley Bogard and Ricky Carmichael go at it on minibikes or see what the new Fox gear was going to look like. I'd ride my bicycle around the Fox tower and see Todd Hicks unloading his Cadillac (his rental car was ALWAYS a Cadillac) with the new gear and passing it out to their riders. That's the stuff that excited me, and getting to watch all of that talent year after year at Loretta's is really what made we want do what I'm doing now. I never wanted to ride for Team Green; I wanted to run it and pick the best guys and have cool bikes! I want kids now to look at our program and think like I did. I told our team riders one year about how much of an impact they have at Loretta's because they're the kids who everyone is looking up to. They see Jett Reynolds walk through staging and think, Holy crap, that's Jett's Reynolds, he’s won all these titles here, he’s won the Monster Cup, he's rad, his bike is sick… I try to teach them to carry that confidence because it means so much. I don't remember how we even ended up going for the first time. Being from Pennsylvania and racing in District Five, we were obviously a little more close to the scene since MX Sports/Racer Productions ran some of our local races at places like High Point, Steel City, and Brownsville. My regional in 1991 was at Frozen Ocean in New York, and that was furthest away I had ever gone for a race at that time. I probably remember more from that first time to Loretta's in 1991 than I do from 2011. We rented a small motorhome and the PW50 went inside. It was complete culture shock when we got there. The factory rigs, kids with all of these bikes and sponsors… It was overwhelming, and I remember getting sick before practice because I was so nervous! After that first year, I was so infatuated with the whole event and everything about it that I felt like I could never miss it. I explicitly remember “Coal Miner's Daughter” playing first thing every morning and hearing this guy called Mr. Record that was like a radio DJ that sat in the bottom of the tower. He was like the Patches O'Houlihan character from the movie Dodgeball. He was in a wheelchair and looked like a bum. Tim Cotter and Erv Braun would be announcing, and Mr. Record would just cut in on them with random things to say. I don' think he knew anything about motocross, but he was really funny. I was already pretty passionate about the sport at that age, but I went to another level after going to Loretta's. 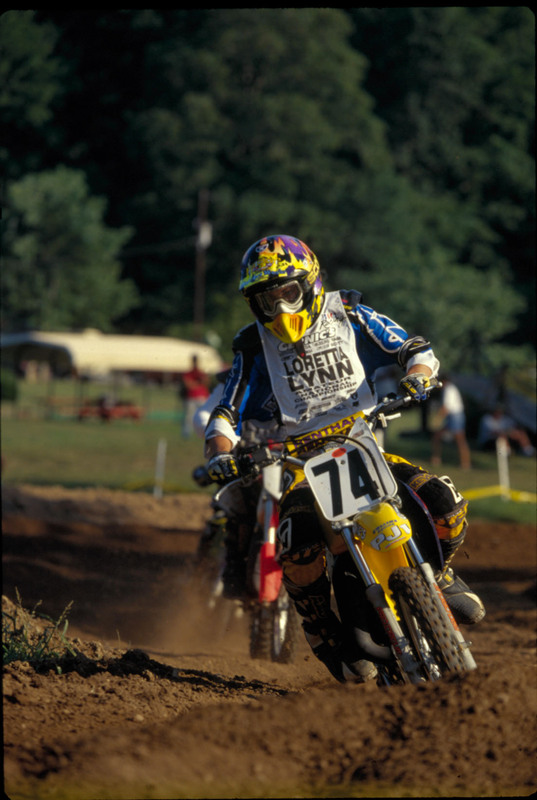 In 1992, I broke my foot and couldn't race my regional, but we went to Loretta's anyway. We bought a scooter so I could get around, and I put 100 miles on it in one week at the ranch. I ripped that thing everywhere! I was nine years old, and the thing I remember most was my mom getting me a pin from Team Green. All the Kawasaki racers that made it got a pin from Team Green, and my mom went to the Team Green pits and asked Sharon Richards if I could have a pin since I wasn't racing. They chatted it up and discovered that they went to the same or neighboring high school outside of Pittsburgh. That was my first experience with Team Green—my mom getting me a pin. Now I live a few blocks away from Sharon Richards—only in California—and now I work for Team Green. We raced locally pretty much every weekend from March to October, so we saw the Coombs family on the weekends all year and all their regular crew that would end up working at Loretta's, too. The bucket they used with the long white spoons for drawing gate picks at Loretta's was the same bucket we saw at all of our local races. I remember one summer, a couple of us thought we would mark up the ends of the spoons anytime we drew a good number—they had gouges and scratches and were all beat up. We knew those were the good spoons to pick! So a buddy and I made sure to get to staging super early for our first moto at Loretta's one year so we'd get first draw. We picked #1 and #2 because we had a pretty good idea which spoons they were. At that point, I think the person doing the spoons was onto us. 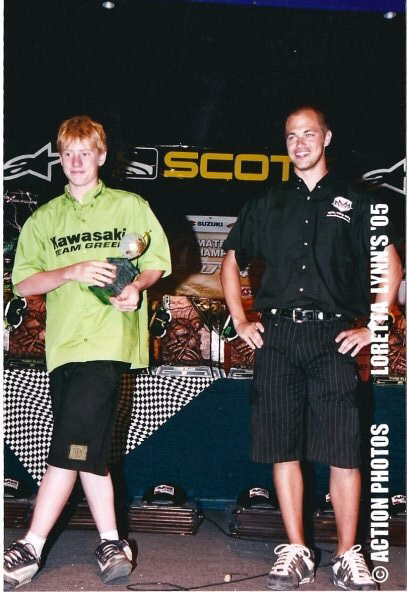 My last year racing at Loretta's was in 2000, and I was starting college right after the race. I figured it was my last chance, so I took it seriously and really prepared and put in a lot of effort. I rode all summer with Gene Stull, who was Suzuki's top amateur, and I felt really fast that year and confident I could be top ten. I crashed in the first turn of my first moto and came back to 15th or something, so I felt pretty good. Unfortunately, that was my best moto ever. Next class something happened and I did bad, and something clicked that I was just over it; I was thinking so much about going to college that my mind wasn't there. Each moto just got worse, and I should have just quit racing after the race that year. My heart wasn't in it anymore. It wasn't fun, and I was ready to pursue life on the other side of the fence. 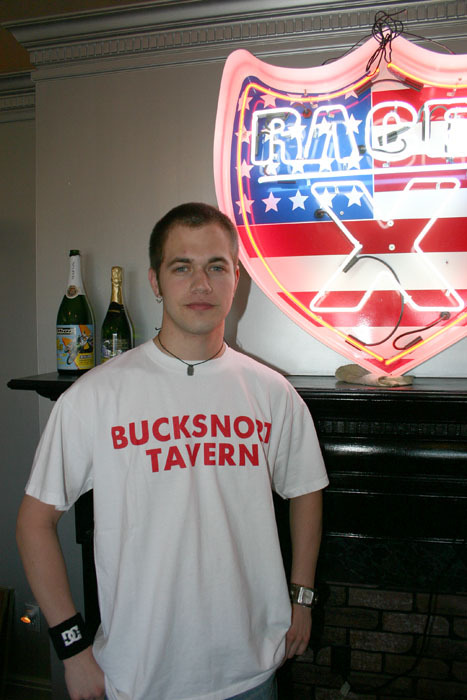 Two weeks later, I was drinking beer and chasing girls in college. Then it was mailing stickers and getting Carrie Coombs coffee while interning at Racer X, and that was the beginning of my career in the industry, though it really started on that first trip to Loretta Lynn’s in 1991.